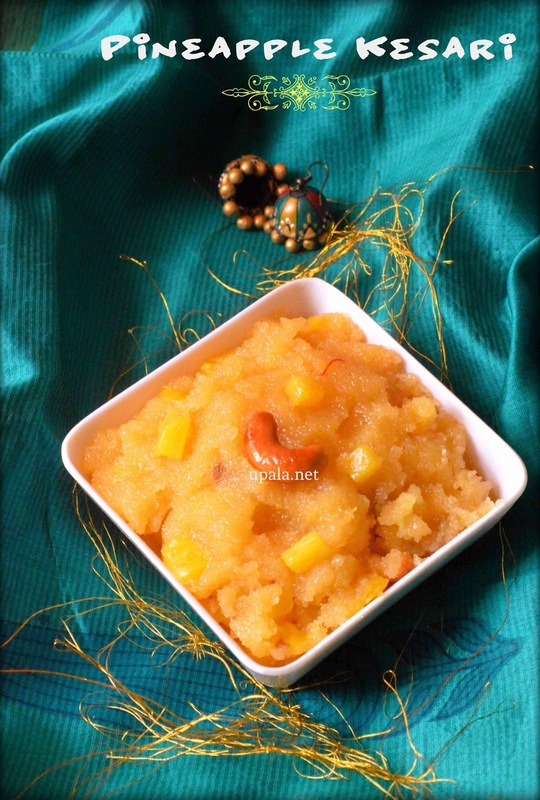 Pineapple Kesari/Kesari bath is a yummy halwa made of sooji and pineapple. I loved it so much from the very first time when I tasted this yummy Pineapple Kesari in a hotel. Also the kesari was not prepared in the usual way, they added cloves which gave a different taste. When I tried the same at my home it was a super dooper hit. 1) Heat 2 tbsp of ghee in a kadai, roast cashews till light brown then add dried grapes/Raisins and fry till they puff up. Transfer them to a plate. 2) In the same kadai with remaining ghee add cloves and fry. Next add Rava/Sooji and roast. 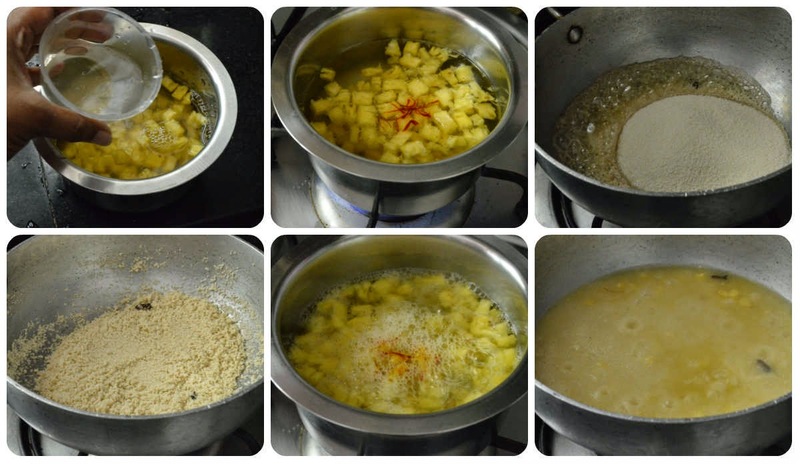 3) While rava getting roasted, add 2 3/4 cups of water, saffron to pineapple pieces and leave it to boil. 4) Roast the rave till nice aroma arises. Now add this boiling pineapple water to the rava and mix well. 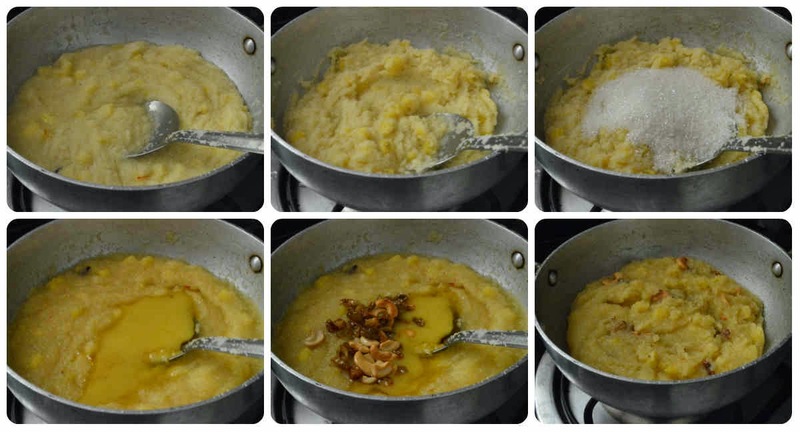 5) Stir continuously to avoid forming lumps and rava needs to get cooked in Pineapple water. 6) Now add sugar and stir nicely. After sugar melts the kesari will loosen up. 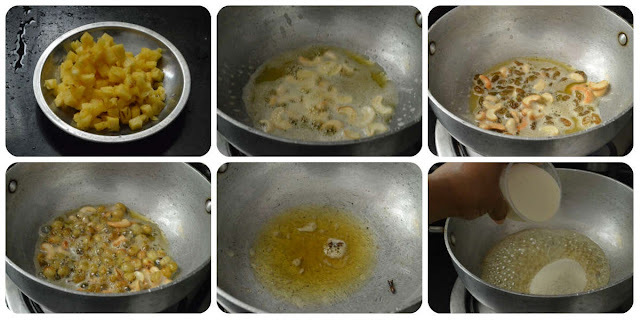 Now add remaining ghee, fried cashews, rainsins and stir them. Yummy Pineapple kesari is ready. 1) Alter the water and Sugar quantity according to the type of Sooji/Rava and taste. 2) You can also add more cloves according to your taste.